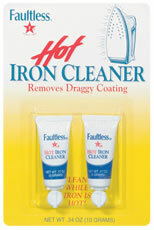 Sign up to receive your two FREE .17oz tubes of Faultless Hot Iron Cleaner. Samples will be given on a first come, first serve basis. *You will receive two .17 ounce tubes of Faultless Hot Iron Cleaner on one card, plus valuable coupons for other Faultless Starch/Bon Ami products.